Oh, don’t we just love a good stinging pain? No, this is not some sado-masochistic bent to be released only in deep dark privacy. 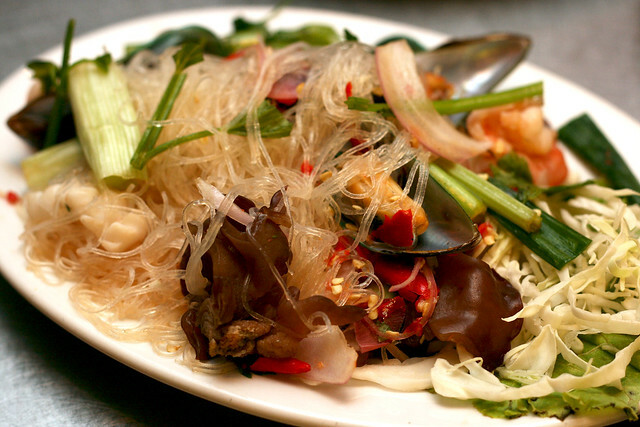 The quest for tongue-burning and sweat-inducing spicy thrills exist in almost every culture. Our tolerance for fiery blasts of heat is openly celebrated and even boasted about. Spicy food is an addictive love affair. 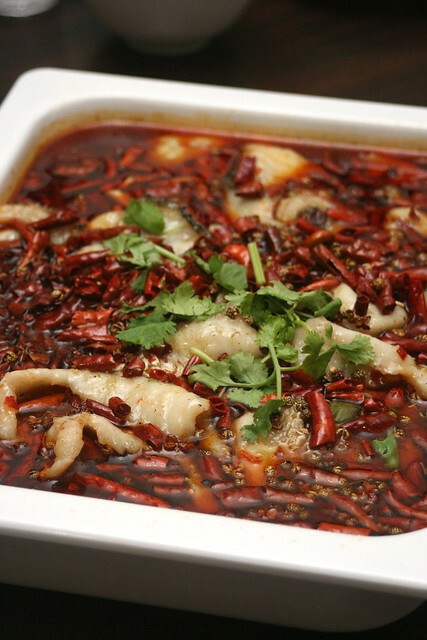 From the numbingly hot “mala” Sichuan cuisine (possibly the most spicy of all Chinese cuisine), we have chili-laden dishes like the signature 水煮鱼 Fish Fillets in Hot Chili Oil (photo above), steaming mala hotpots, and Chong Qing deep-fried chicken nibblets that taste like heavenly crispy pork lard infused with devilish heat. Thai food is often exceedingly spicy hot, thanks to the liberal use of chili padi or bird’s eye chili. A good tom yum should send your pores perspiring to douse the heat. Even their salads like som tum and yum woon sen (above) will burn. And watch for the dipping sauces - they are often spiked with chili padi. Mexicans love spicy food too - mixing lots of herbs and spices into their staples of beans and corn. Mexican chili peppers range from subtle (poblano) to strong (habaneros). If a snack or dish is not spicy, they will add hot sauce to it. The ancient Aztecs and Mayans believed chili peppers were an aphrodisiac. Indians have their iconic spicy vindaloo, among many complex spicy dishes. Chettinad cuisine is probably the most spicy regional Indian food. The Portuguese gave us “piri piri” sauce, made using African birds eye chili. The Japanese who usually have low tolerance to chili heat also have uncharacteristically spicy ramen variants, usually nicknamed hell bowls. Locally we can’t do without chili in our dishes. 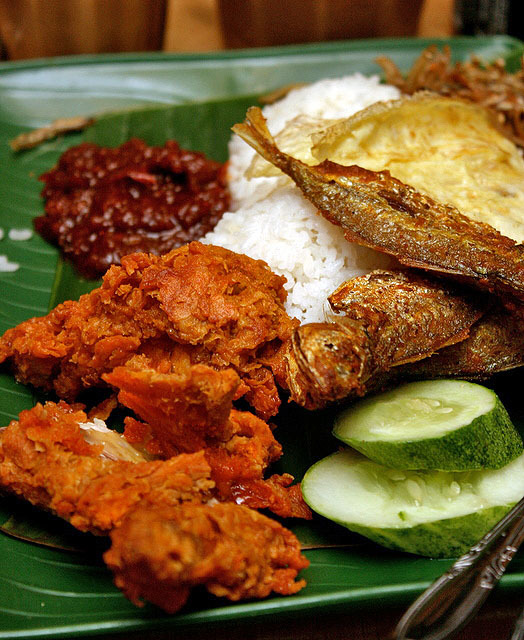 What would nasi lemak be without its sambal? Our Hainanese chicken rice without the gingery chili sauce? Peranakan dishes without sambal belachan? Something would feel sorely missing. Even for our rice and noodle dishes, we need that chili kick. We need our chopped red chili, pickled green chili, XO chili, and ground dried chili in oil. Salt and pepper just doesn’t cut it as additional seasoning. But with so much chili in our dishes, we are often reduced to needing quick relief. Drinking water, even cold water, doesn’t help - it just spreads the oil-soluble chili around the mouth, causing possibly more heat sensation where previously was none. You need something to wash away the excess chili fast. Milk has fat in it that helps, but it’s a lot of saturated fat. What I find works for me quickly in a pinch is an ice-cold glass of Coke. Coke Light or Coke Zero works well if you don’t want extra calories. The fizz also distracts from the chili heat. Capsaicin is what makes things spicy, and the good news is - it’s an antioxidant. The more capsaicin, the hotter the sensation, and the more antioxidants you’re consuming. The pain stimulates a rush of endorphins - morphine-like compounds that give you a natural high! Out of pain, comes pleasure. So go ahead and indulge. If you’re not one for spicy food, don’t worry. It’s something that can be trained. Just like weight-training, you add on a little more each time. And soon you’ll be a spice-hardened champion. Just keep some Coke handy always! Follow @cokesg on twitter to find out more tasty treats.